Ramen from Japan, China, and the rest of Asia. A guide to all different varieties of authentic ramen and it's history. No instant ramen here. 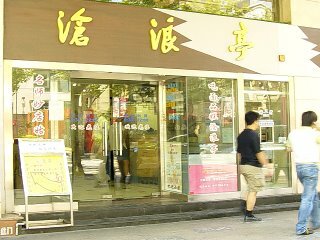 CangLangTing is another ramen chain store in Shanghai that I visited during my last trip, right after entering this place I noticed it was a few ranks above the other places like ShiZhiLing or BeiWanXin. CangLangTing was cleaner, the interior slightly fancier, but most noticeably was the quality of service. The waitress can still be a little impatient when asking for you order, but overall things felt more professional. The kitchen was busier, waitresses in the store were moving around faster, you ask for a napkin they'll give you a napkin rather than a very long stare. CangLangTing has a seasonal menu, four different types of ramen corresponding to the type of meat or seafood that is available during that season. I visited during Summer time so I gave their 三虾面 (sanxia mian) or three shrimp noodles a try. The Soup - was very nice. A rich pork broth that had a hint of shrimp flavor to it, seasoned with soy sauce. This soup is as good as some of the best ramen that I've tried in Japan, the wonderful flavors of the pork and shrimp dominates, the seasoning is just right and not too salty. 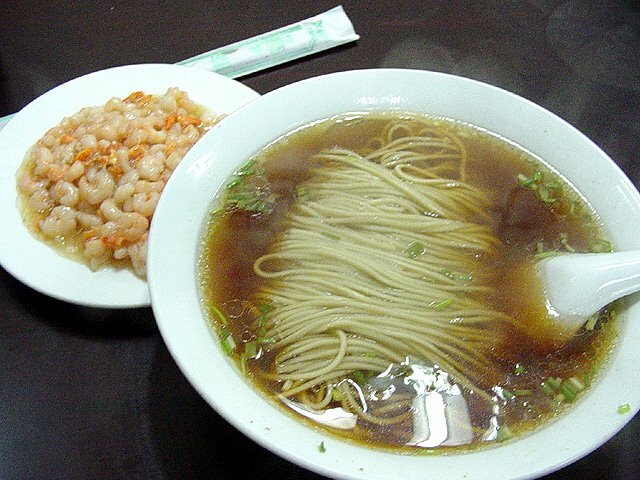 The flavor and style of this ramen soup is similar to Suzuran in Japan. The Noodles - are thin, straight noodles cooked quite firm. Again the standard Shanghai noodles with its chewy texture, these noodles went great with the soup. Just the combination of the soup and noodles would make me recommend this place. The Toppings - were baby shrimp stir fried with dried shrimp in a thick Chinese rice wine sauce that was served on a separate plate. This dish was absolutely delicious. The aroma of the dried shrimp and rice wine went so well together, I wished I had a bowl of rice to go with it. However, it didn't seem to match a bowl of ramen as good though. Overall - if you are in Shanghai and you want to try some of the local ramen then CangLangTing is the first place you should go. The place is pricy though, $4 US dollars for a bowl of noodles! no wonder why the locals are complaining about the price on the message boards. (Usually, a bowl of ramen is about .60 cents to a dollar US.) I hope to try out the rest of their seaonal ramen which includes: Spring - mackerel pike ramen, Fall - shrimp crab ramen, and Winter - lamb ramen. I will be visiting Shanghai in March. CangLangTing seems to be worth a try. Do they have an English (or picture) menu? We plan to have XLB there. Anything other you may recommend? 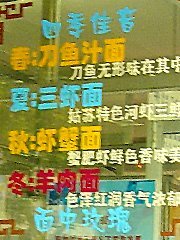 The noodle shop in Taipei also sounds interesting. Will English pass there? Also on this trip will be Hiroshima, Kobe, Okinawa and Seoul. do you have any recommendations there? I often travel between the US and Asia and have been trying out all the unique ramen of every country that I visit. Hope you are a fan ramen (麺, ラーメン), or will become one soon.